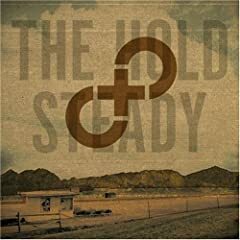 The Hold Steady's fourth album, Stay Positive, is released tomorrow. For anyone new to the Hold Steady looking for a point of breaking and entering on Stay Positive, start with “Sequestered in Memphis.” It’s as immediate and infectious as “Your Little Hoodrat Friend.” The same goes for the title track. Musically, two songs are real standouts: a guitar solo provides a plaintive wail on behalf of the rocky couple on “Lord, I’m Discouraged,” while the harpsichord becomes the voice of the protagonist on “One for the Cutters.” The instruments aid and abet Finn as he articulates the inner turmoil of his characters’ lives. Other than Stay Positive, the only other new releases I have heard and can strongly recommend are the new Wire disc, Object 47, Blind Pilot's 3 Rounds and a Sound and Herman Dune's 1-2-3 Apple Tree EP. Three Del Fuegos albums (Boston, Mass., The Longest Day, and Stand Up) lead the week's reissues, along with two vinyl releases (Rocky Votolato and Suicide Medicine) from singer-songwriter Rocky Votolato. Damon & Naomi's More Sad Hits has been remastered and is also available tomorrow.